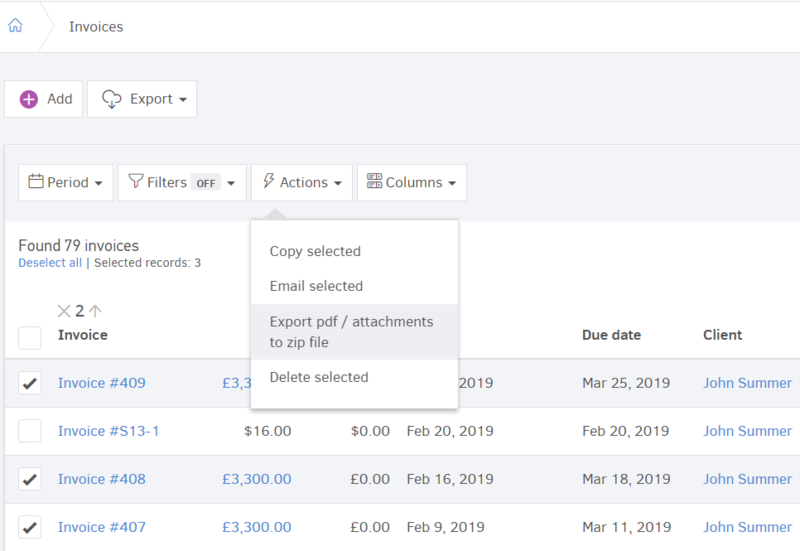 The bulk export of pdf and attachments action is available for the Invoices, Estimates, Payments received and Credit notes (sales). As for the Bills, Payments sent, and Supplier credit (purchases) you cannot download records in pdf but you can download their attachments. All of those data will be gathered in a zip file, created by Elorus, which you can then download. The first step is to select the records you want to save by checking the box to the left of each record. Then, choose "Actions" and click on "Export pdf/attachments to zip file." Elorus will display a window in which you are asked to choose if you want to save the documents in pdf, the attachments, or both, by clicking on the circle located above each paper clip icon. If you proceed, Elorus will create a zip file with the data requested. The process may take some time. Once the file is ready, you will be notified via email containing a link that takes you to that file. Clicking on the link will start the download process of the zip file, which you can now find on your computer's default folder for your downloads. Export of PDFs and attachments is especially useful to your company's accountant who, if given access to your data, can download your revenue and expenses in bulk to keep them in your books. For instructions on inviting the accountant to your Elorus organization, see the relevant article.